We present our reviewers' Top Ten lists for 2016 in this month's Pick Hit, with names like Corey Dennison Band, Curtis Salgado, and Toronzo Cannon showing up on multiple lists. 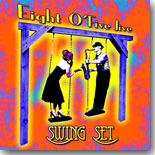 Nashville-based jump/swing revivalists Eight O'Five Jive make the cut as our Surprise pick of the month with their new CD, Swing Set. It's party time! Our Flashback feature takes a different twist this month. Instead of flashing back to an older album, we instead cover a new CD, Blue & Lonesome, as the Rolling Stones go back to their roots for a straight blues disc. Our What's New section features new CDs from the Knickerbocker All-Stars, Ina Forsman, Trudy Lynn, Deb Ryder, Mississippi Heat, Lady "A:, Reverend Billy C. Wirtz, Colin James, The McKee Brothers, Donald Ray Johnson, and more .